The Go-Go’s (pictured l-r): Belinda Carlisle, Charlotte Caffey, Gina Schock and Jane Wiedlin. 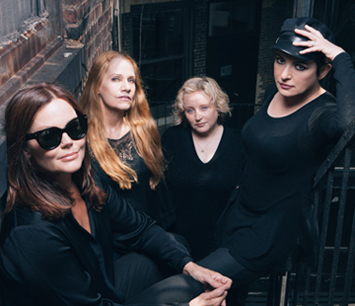 Currently, the Go-Go’s have announced that they will be embarking on a Farewell Tour this summer. They will be playing 18 shows in August (2016), starting in Clearwater, FL on August 2, and concluding in Los Angeles on August 30. We are pleased to do a new interview with Caffey, about her songwriting, and how she wrote some of the Go-Go’s enduring hits. But before we start the interview, here is some background information on Caffey’s songwriting career, with the Go-Go’s and for other artists. Caffey, who plays guitar and keyboards, joined the Go-Go’s prior to their first album, Beauty and the Beat. Impressively, she wrote or co-wrote eight songs on the album, which was certified triple platinum and was selected by Rolling Stone magazine as one of the “500 Greatest Albums of All Time.” Caffey also wrote multiple songs for the Go-Go’s next two albums: Vacation (1982) and Talk Show (1984). Later on, she co-wrote nine songs on the band’s 2001 album, God Bless the Go-Go’s. In total, the band has sold over seven million albums. During the periods when the band had broken up or were on hiatus, Caffey continued to write songs for other artists. In particular, she was a major songwriting contributor to Belinda Carlisle’s solo albums. She co-wrote five songs on Carlisle’s debut album Belinda (which went gold), and four songs on the follow-up album, Heaven on Earth (which went platinum). Caffey also co-wrote nine songs on Carlisle’s fifth album, Real (in 1993). In addition, Caffey has written songs for her band, the Graces, which included Meredith Brooks and Gia Ciambotti. Interestingly, she has also co-written songs for the popular, female rock band, the Bangles. In 2000, Caffey had success in a different genre, co-writing the country song “But for the Grace of God,” which became Keith Urban’s first number one hit. DK: On the Go-Go’s first album, you wrote or co-wrote eight of the songs. When the Go-Go’s first started out, was it clear that you and Jane Wiedlin would be the main songwriters in the group? Caffey: When we started out, they asked me to be in the band, and two months later I went to England for a brief moment and came back. They had been writing during that period, while I was gone. Belinda and Jane had written songs, and so did a couple other girls in the band. But for me, it was really when I brought in “How Much More.” I said to the girls, “I have a song [that I want to bring in].” I was a little nervous because all the other songs that the band was writing were very punk and very kind of angry—even though I loved them—I thought, let’s take a chance and bring it in. When they heard it, both Jane and Belinda freaked out over the song. Jane and I finished it, and that kind of changed the direction of the music in the Go-Go’s, because “How Much More” was more of a pure pop song. So Jane and I started writing at that time, and we just kept writing. But I also wrote songs with Belinda. My writing partnership with Jane pretty much defined the sound of the songs. And of course as a band, we created (together) the sound of the band. DK: As a songwriter, did you see yourself as more pop, or more punk rock? Caffey: You know, my songwriting is all over the place. I don’t pidgeonhole myself into one (style) or another. Because at that time, how we interpreted “How Much More” was very punk. It was totally raw because we played it raw. We weren’t great, great players, but what that did, was make a really melodic song sound kind of rough, so it was kind of cool. DK: You wrote “We Got The Beat,” which was one of the group’s biggest hits. How did you write this song? Caffey: It happened one night—I was in my apartment and the Twilight Zone marathon was on TV—I remember that. Very late at night, an idea came to me. Luckily, I scrambled and found my cassette player and put it on a cassette. And then the whole song kind of came out. It was just one of those moments—you don’t know really where it comes from (laughs). But it kind of comes in your head and Boom!—it’s out. So that’s how that happened. DK: You’ve written many songs by yourself, and with co-writers. Do you have a preference, on whether you like writing by yourself, or co-writing? Caffey: I love collaborating, and I also love writing by myself—I just love writing. But I love collaborating, because what I love is what the other person brings that I may not think about or I may not do. To me, you’re creating something obviously new, with the hybrid between these two energies. So that’s what I like. at Central Park in 2001. DK: For the group’s second album, you wrote the hit “Vacation” with Jane Wiedlin & Kathy Valentine. How did this song come together? Caffey: Well, Kathy had recorded this song with her band, the Textones. You can find it online—it’s an interesting little piece to listen to how it was. She brought it to me, and I really felt like it didn’t have a strong chorus, and I felt the verse needed some work. So she said “yeah, let’s work on it.” So what you hear (on the Go-Go’s version) is what I wrote as opposed to what was on the Textones’ version. On our version, you can hear that I elevated the chorus. And Jane wrote some lyrics at the last minute, so that’s how this song came together. DK: When you’re writing, what’s your songwriting process? Do you usually come up with the title or lyric first, or do you usually write the music first? Caffey: I have no specific way—any way that it happens is fine with me, because I could just be going about my day, and all of a sudden an idea comes to my head. It’s not like I labor over it, if you know what I mean. And when I try to labor over it, nothing ever happens! (laughs). I just kind of let it fly in there when it does. Sometimes I’ll have a title come to me and I’ll write it down for later. Or I’ll have a chord progression or melody, and I’ll just sing it into my phone. It’s very on the fly now. It’s easy to do because we have our phones and stuff. DK: I also love your song “Head Over Heels,” which has a great piano part. Did you write this song on piano? Caffey: Yeah, I came up with the piano riff. It was the first thing I toyed around with. I wrote almost the whole song, and then I asked Kathy to help me finish it. This happened over the course of six months. I kind of kept chipping away at it. Every time I would sit down I would just play, play, play. I love that song—it works really great live. DK: During the periods when the Go-Go’s were not active or touring, did you mostly focus on your songwriting? I know you wrote many songs for Belinda Carlisle’s solo albums, and you’ve also written with the Bangles. Caffey: Well, songwriting has always been my main thing, even when [the Go-Go’s] are active. It’s just kind of what I do. Certainly, when we’re not active I would have more time to write. DK: You’ve written some songs with the Bangles. Are you friends with them? Caffey: I’ve always been friends with the Bangles. I worked with Susanna (Hoffs) a lot in the mid-’90s on some solo stuff. Some of those songs just kept sticking with us over the years, and they ended up recording one of them in the last five years. So it’s great that when a song is good, it will find a home, even if it doesn’t find one right away. DK: Years later, you and Jane co-wrote a number one country hit for Keith Urban, “But for the Grace of God.” How did you co-write this song? Caffey: Jane’s husband at the time was managing Keith Urban, who had a band called The Ranch. He suggested we get together and write with Keith. The story of this song is pretty funny. We first sat down and tried a couple ideas—it was one of these sessions where we were going Aaah, this isn’t going to work…nothing’s really happening. But I had this title floating in my head, and I’m like, Gosh should I say it? I said okay, and I said it—But for the Grace of God. And then Keith loved it, and within five minutes the song was written. We kind of wrote it and parted ways. Then you fast forward a few years—Keith [was going through some tapes] and happened to hear our song and it was like, “Whoa.” He had forgotten about this song. So he showed it to his manager, who said he needed to record that…Now. He went in the next day and recorded it, and it became his first single that brought him to number one. So that’s a nice little story. DK: I read that this summer will be the Farewell tour for the Go-Go’s. How did you decide that this would be the final tour? Caffey: It felt right (to announce it as a farewell tour). We’re not breaking up, per se—we’re just not going to be doing the touring like we’ve been doing for many, many years. We might still do a date here or there, or do a benefit or something like that, but not do the big touring anymore. So that’s what that’s about.